Egyházaskeszo is a village in Veszprém County in Hungary near to Town of Pápa (17 km to north) on the Little Hungarian Plains. The village has got 618 inhabitants (1990 census) all of them are Hungarians. The first mention of the village is from 1361. The landlord of the village was the Bishop of Gyõr. In the village there is a Baroque Roman Catholic Church (1782). The flag is going to be adopted in 19. 08. 2000. Ratio of the flag: 3:2 and ratio of the "labarum": 2:5. On the flag there is the Coat of Arms. The swallow-tailed flag is white with gold edge and at the end of the swallow-tails is a gold tassel. Symbolism of the Coat of Arms: The church in the first field relates to the history of the village. The village was the seat of the parish of the neighbouring villages too. 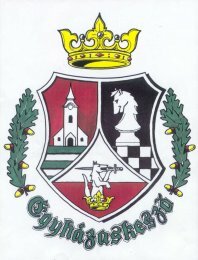 (the first part of its name: Egyházas means Parish). The two silver stripe relate to the Bittva and Séd Brooks. The red colour relates to the past with bloody wars and conflagrations. The chess-man relates to the famous celebrity of the village: Árpád Élõ, who creats the scoring system of the chess (Élõ Points). The silver wolf pulling out a dagger from its throat is from the shield of the Noble Keszõi and Recski Family which lived there. The family had been given its name about the village.